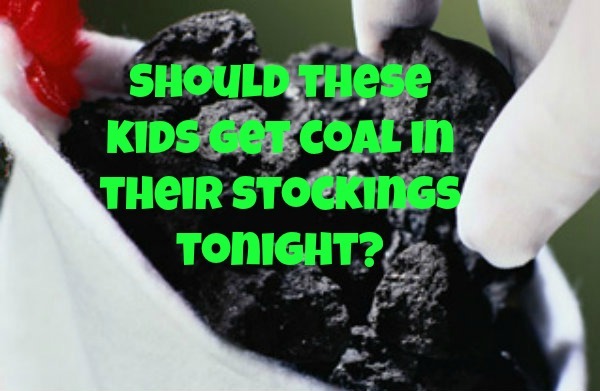 You are at:HomeUncategorizedShould these kids get coal in their stockings? Should these kids get coal in their stockings? In the last couple of weeks, I have told the story about how my then 3-year-old son lied and said he didn’t eat any of the chocolate cake batter while his face was covered in it (and had video, too! )AND about how my then 4-year-old sister said she didn’t buy my dad a brush when he could feel the bristles right through the Christmas wrapping paper. Not wanting to feel like we were the only family with some little liars in it, I appreciated the comments on the posts and the funny stories shared on the Kelley’s Break Room Facebook page when I asked for more. So, you be the judge. Or, you be Santa Claus, I guess. He’s the stocking stuffer. Emmy Mom (Emmy Mom: Taking Life One Day At A Time): My oldest two were downstairs playing while I was trying to get ready for the day. I had already had to go downstairs twice while getting ready to get them to stop fighting. They were finally both settled down playing on their own and all was quiet when my daughter comes running upstairs saying that her brother bit her. She even showed me the bite mark on her hand. But I saw the look on her face, realized I had not heard any sort of yelling and asked her why she bit herself- the look on her face told it all. Toni: I have a niece who used to snag her uncle’s chips out of his lunch bag. After weeks of putting up with it, he opened the bag, dumped a whole small bottle of hot sauce on them, warmed them in the oven to crisp them and resealed them in the bag. He was getting ready for a road trip for work when she grabbed his lunch. She couldn’t tell us what was wrong because she would have been caught fibbing. It was the last time she took his lunch. Leslie Marinelli (The Bearded Iris): She actually wrote a whole post about her daughter’s like that as a guest post over at Parenting (Illustrated With Crappy Pictures). It was called “Sticking Situation” because it involves her daughter putting gum somewhere she shouldn’t be putting gum. I can tell you no more. You must go there to read. You must. You know, I’m sort of leaning toward these kids not getting coal. For one thing, it would totally mess up their stocking. The mothers would then have to wash the stocking to get the coal off of it and what would happen to the stocking? Some aren’t washable! It would end up being the mother’s problem ultimately, so, yeah, no coal. Anyway, haven’t we all told a big fat one, especially when we were little? Right? You haven’t? How about your kids?